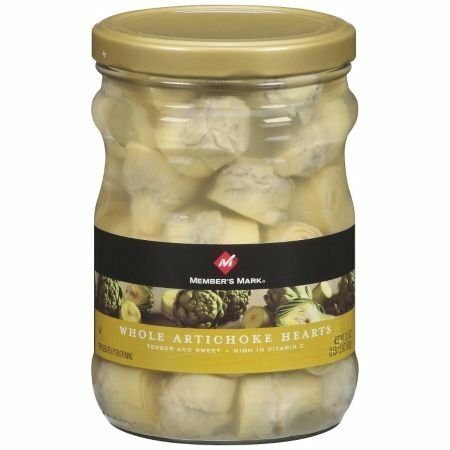 Member's Mark Whole Artichoke Hearts - 33.5 Oz. Member's Mark Whole Artichoke Hearts are carefully selected and marinated to be extra tender and delicious. Naturally high in vitamin C, they're perfect addition to salads and sandwiches. Artichoke Hearts are tender and sweet and are high in vitamin C.33.5 oz. jarGluten-free foodImported from PeruKosherIngredients: Artichoke hearts, water, salt, citric acid and ascorbic acid.Nutrition Facts: Serving size: 1/2 cup (120g) Servings: About 8 Calories: 35 Fat calories: 0 Total fat: 0g Saturated fat: 0g Trans fat: 0g Cholesterol: 0mg Sodium: 380mg Total carbohydrate: 7g Fiber: 2g Sugars: 1g Protein: 2g Vitamin A: 4% Vitamin C: 30% Calcium: 4% Iron: 6%.